Here's the cover of January 1952 issue of the The Knotty Post (the Knott's Berry Farm employee magazine) to ring in the new year. 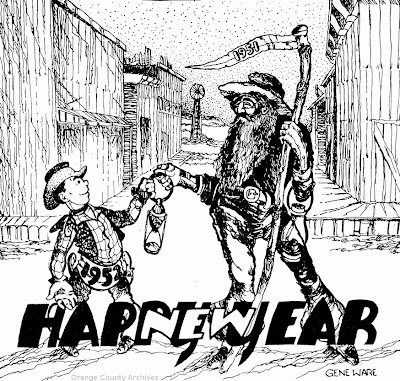 I hope you all have a happy and healthy 2010! 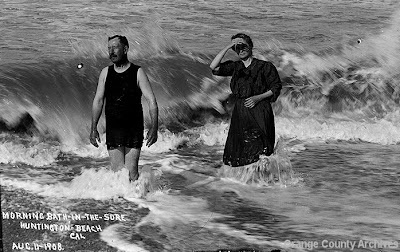 To round out Huntington Beach's centennial year, I'm posting a few photos from 1908, the year before it incorporated as a city. No, I don't know who these people are, but aren't these some great images? Yes, those are sugar beets in the wagon shown above. Note the dog riding atop the beets. Joe Santiago (the guy who owns the historic Charles Warner house, and who now has the Manning House hovering over his garage,) writes to tell us that signed copies of his book, Ebb & Flow: 100 Years of Huntington Beach, are available "at California Greetings on Main and Orange Streets downtown for only $12, or unsigned at DeGuelle Glass on Adams and Alabama for only $10." 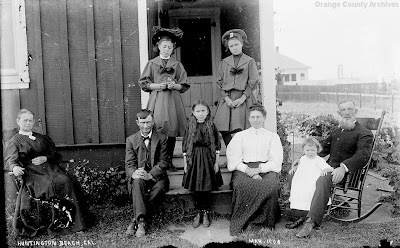 Today's photo shows the Gunther family children and some of their friends in Orange on Christmas Day, 1907. A new bicycle, a new wagon, and a new doll! Gee! Update: I originally took this image from the material posted to Calisphere by the Orange Public Library (OPL). A day or two later, curiosity led me to OPL's own website, to see if there was additional information. Not only was there additional information, there was conflicting information. 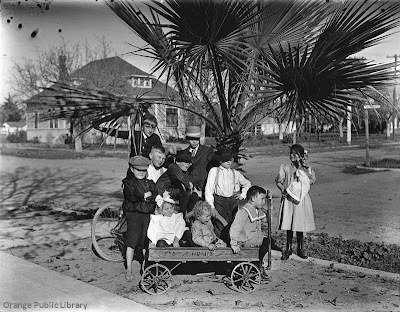 Rather than the Gunther family, they identify the group as the, "Loescher family children and others with wagon, standing beneath palm tree on Christmas Day, 1907, at corner of Palmyra Avenue and Center Street." The OPL site also provides names: "...Left to right, standing in back: 1. Ewald Grum; 2. Henry Rickles; 2nd row: 3. Walter Loescher wearing cap; 4. unidentified bareheaded boy; 5. Hiker Batterman, with black hat; 6. Adolf Dittmer Jr, with black hat & suspenders; 7. Eleanore Loescher, girl with doll; Seated in "Star Coaster Wagon" are: 8. Ruth Loescher; 9. Arthur Dittmer; 10. Elmer Gunther." Perhaps the Loeschers, the Gunthers and the Dittmers were related? "I also have a blog,... The first entry tells you the background on how this project came to be... This is the page to bookmark and check on every so often to learn what is going on with the book. "Be sure to scroll all the way down to the bottom of [each] page. At the bottom, I am trying to include excerpts from many of the interviews I have done over the years, and some of the recordings in my collection." 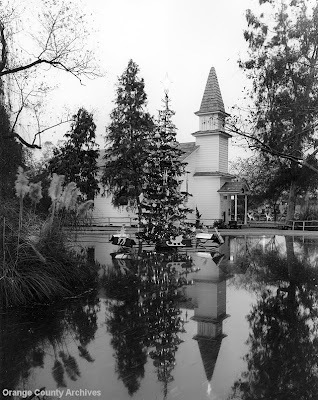 To go along with Chris' news, I posted a photo of Knott's old Church of Reflections at the top of today's post. 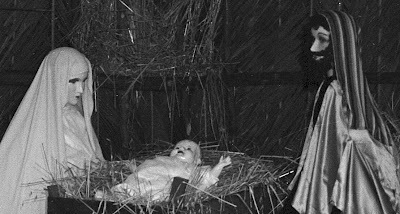 The image below is a close-up from the same photo, showing the Christmas decor (circa the 1960s) in more detail. 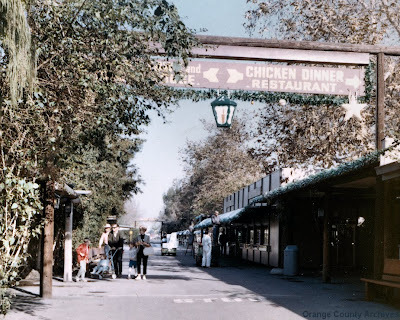 To add a little color to today's post, I'm also tacking on this 1966 image, (below), of the Chicken Dinner Restaurant/shopping area of Knott's. Notice the guys on ladders in the background, putting up Christmas decorations. On very interesting but unrelated note, Kathy Hall recently wrote to let us know about her "website dedicated to the history and architecture of the Broadmoor Homes tract in central Tustin. ...A grass roots effort has formed among some of the residents to encourage the restoration and preservation of these classic midcentury modern houses. Our community was featured in Atomic Ranch Magazine last spring." These homes were built in the late sixties and reflect that era in California Modernism. Thanks for sharing this with us, Kathy! 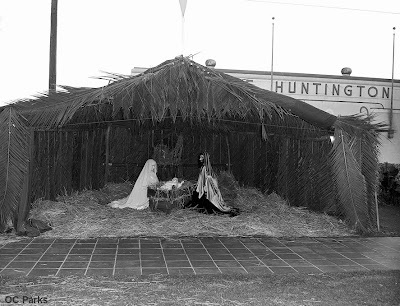 This nativity scene was part of the civic Christmas decor in Huntington Beach in 1950. You can see a bit of the Pavilion (a.k.a. the Pav-a-lon) behind the palm fronds. Duke's restaurant now stands at this location. I'm already WAY beyond my quota for Knott-related posts this year. But how can I ignore the news that Knott's Berry Farm, (along with the rest of the Cedar Fair company,) has been purchased? What will the new owners, Apollo Global Management, do to this historic site? Only time will tell. I hope Apollo realizes what a treasure they have in not only the Farm itself, but in many of the people who work there. 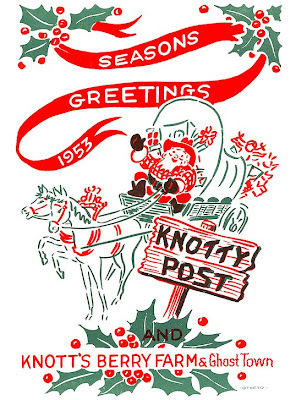 The image above shows the cover of the Knotty Post employee magazine from December 1953. 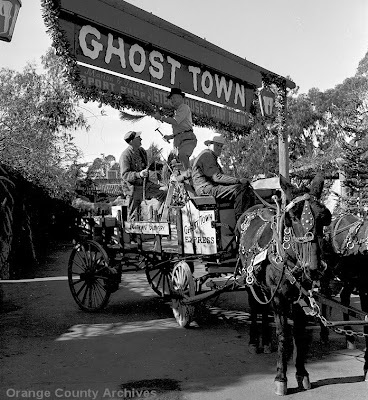 The photo below shows a Christmas garland being hung on the entrance to Ghost Town in about 1962 . 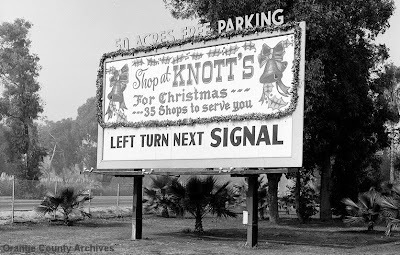 The next photo shows a Christmas billboard for Knott's. It was probably painted by Don Treece, Jerry Nicholson, and the other guys in the sign shop. It's always a little scary when any historic property gets a new owner -- Especially one we don't know well. And as in similar situations, I await their first move with cautious optimism. Bankruptcy, anteaters, apes, Oral Roberts, Disney, FedMart, etc. 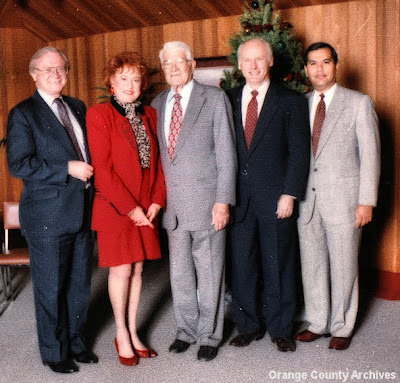 The Orange County Board of Supervisors reach out from 1993 to wish you Happy Holidays. Little did they know that by the following December there would be a lot fewer smiles on the 5th floor of the Hall of Administration. Thanks to Robert Citron and some bad investments, the County was on its way to bankruptcy. Looking at this photo, you wish you could go back in time and warn them. The Anteater Antics blog has had some fun posts about UCI lately, including cartoonist Johnny Hart's anteater design, Ansel Adams' visit, and the filming of The Conquest of the Planet of the Apes. Two celebrities who, (previously unbeknownst to me,) lived in Orange County, also died here this week. First, televangelist Oral Roberts (who I think we all figured lived in the Deep South) and then Roy E. Disney each died in Newport Beach. I saw Roy Disney in person exactly once. I was visiting the old Animation Building at Disney Studios for the first time when an elevator opened near me and the SPITTING IMAGE of Walt Disney walked out. I had no idea who Roy E. Disney was at that point in my life, but the look-alike factor gave me quite a shock. For a moment I wondered if the urban legends about Walt and cryogenics were true. Speaking of those who have "passed on" recently, the Pleasant Family Shopping blog has a nice post about Sol Price, the man who brought us FedMart and Price Club. Remember when those chains had stores all over Orange County? The Disneyland Nomenclature blog has a great post on the aborted Discovery Bay project at Disneyland in the late 1970s. They even (for a limited time) have a downloadable audio clip related to what could have been a whole new "land" within the park. 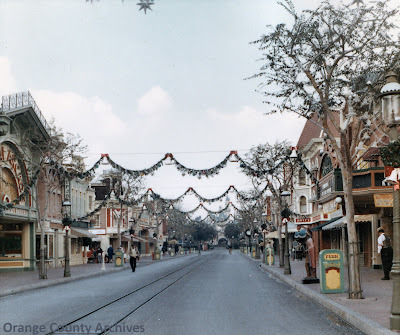 Today's photos both show Disneyland's Main Street, U.S.A. in December 1966. The place is almost empty in the image above, which was taken by someone working for Knott's Berry Farm. By contrast, look how many people are in the Disney promotional photo below. Personally, I'd rather go to Disneyland on the day shown above. Walt Disney died that same month, exactly 43 years ago today. Heaven knows what else he and his companies might have accomplished had Lucky Strikes not taken him so soon. In any case, only three days after his death, "Disneyland Around the Seasons" was broadcast on national television, feature Walt as its host. A clip of that program, showing a jetpack flight in Tomorrowland, is available on YouTube. The entire program is available on a great DVD set entitled, Disneyland: Secrets, Stories & Magic. 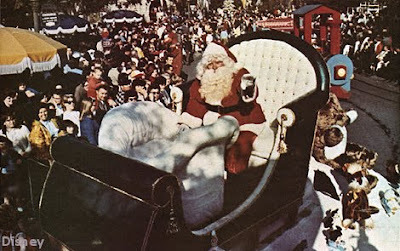 Before malls and "big box" stores, where did people do their Christmas shopping? Downtown! 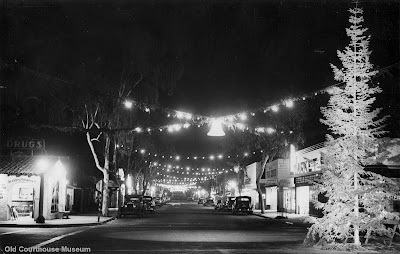 Today I'm posting a few images of Downtown Santa Ana at Christmastime in the 1930s. The photo above shows the 100 block of E. 4th Street, including J. C. Penney in the foreground and Montgomery Ward on the near side of the intersection with Main St. That "Monkey Wards" building was a real art deco beauty. It's now a parking lot for First American Corp. The next photo, below, shows N. Main St., between 2nd and 3rd. I think I prefer the over-the-street garlands they used today over the ones they used during the last depression. 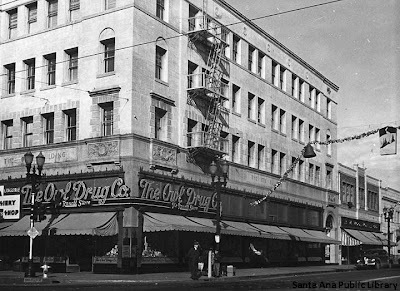 Today's last photo, below, shows the Otis Building at 4th St. and Main, an intersection which was long the hub of commerce in Santa Ana. The building still stands and hasn't changed much in appearance. However, the Owl Drug Co., which was affiliated with Rexall, is long gone. All photos in today's post come from the history room at the Santa Ana Public Library. 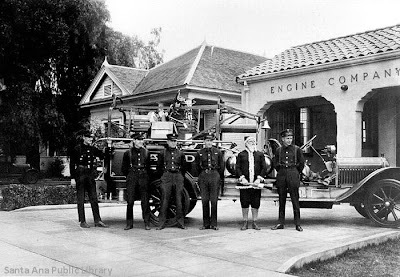 Here's a photo of the men of Santa Ana's Fire Station #4, taken around Christmas 1927. 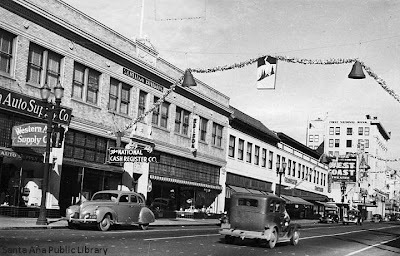 Photo courtesy the History Room at the Santa Ana Public Library. Thanks to all the great authors who came to the Orange County Historical Society's Authors Night yesterday evening! We were all introduced to some interesting people and interesting new local history books. 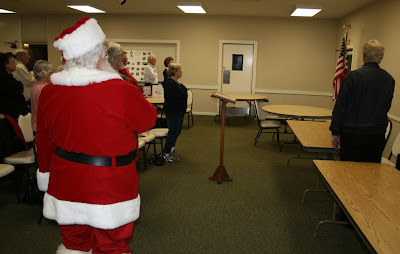 And as you can see in these photos, Santa Claus also attended. He even led us in the flag salute. (That's right, Santa's an American! No toys for you, Kim Jong-il!) More photos from the evening are posted here. Legal action by the Friends of the Lacy Historic Neighborhood has (at least temporarily) halted the demolition of 15 historic homes near the train station in Downtown Santa Ana. This should provide a stay of execution until at least May or June. Hopefully, the City and the preservationists can work together to find a better solution by then. The Lyon Air Museum has finally opened across the runway from the John Wayne Airport. I got a tour of it last year, (when only a fraction of their displays were in place,) and it was already pretty amazing. If you have any interest in historic airplanes or WWII, it's a definite must-see. Daralee Ota has added information about Barbara (Danker) Oldewage and Ernest Danker to her Olive Through The Ages website. 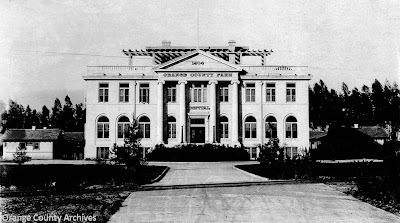 According to UCI Medical Center, the old 1914 Orange County Hospital building they inherited "is being demolished soon." The building had a couple additions over the years, but they were consistent with the original design. The central portion of the building looks much like it did when it was new. Go see it (amid the towers of UCI Medical Center) while you still can. I've also posted a couple recent photos of the front and back of the building on Flickr. For its part, UCI Medical Center will hold an event "Celebrating the Life of Building 10" on Jan. 28, 11:30am-1pm. "We invite you to hear from leadership and employees whose lives have been touched by [our] oldest building. Refreshments will be served." They are also holding a "storytelling contest": "Share with us your fondest memory of Building 10 before it's removed from our medical center campus. Write a few sentences about the impact or impression this building has had on you. All contest participants will be entered into a drawing for a $25 gift card. Your story may also appear in print and be featured at this event.The contest deadline is Friday, December 18, 2009. Please e-mail Connie Worden at clworden@uci.edu." Maybe some of you historians out there can use this as an opportunity to tell the story of the County Hospital. Newport Beach, Christmas, Peanuts, Dana, etc. 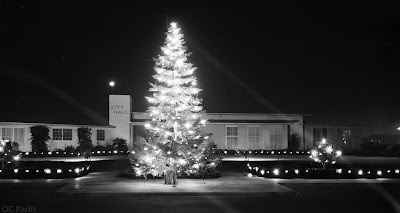 Today's photo shows Newport Beach City Hall in Dec. 1950. Currently, a new City Hall is being planned for a site near the Central Library. With all the local historical societies, museums, etc in O.C., it's now officially beyond me to keep track of all their holiday events. I'll still post news of Christmas events that comes my way, but please also check the links in the right-hand column of this blog for your local organizations. Also, you might want to check the calendar on Yahoo's O.C. History Group. .
Craig Lockwood of Laguna Beach recently completed a book about early Laguna lifeguard and surfer George "Peanuts" Larson. John Felder recently posted about William Henry Dana on his "Laguna Beach History" blog. 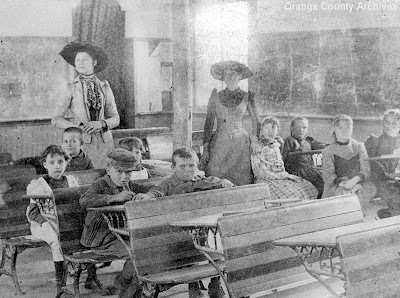 I was going to mention something when our Orange County History photo pool on Flickr reached 150 members. Well, we sailed right past that mark this week and now have 158. As of this writing, 2344 photos have been posted there. Thanks for all the great photography! For the last entry in this series, we're going back to the first house Walter Knott built for Cordelia after they were married in 1911. As you can see in the "after" photo above (and another below), it still stands at 1040 W. 4th St., in Pomona. Walter had a good, stable job as a foreman for a cement contractor. It was this job and this home, along with friends, family, and the comforts of life "in town," that the Knotts left behind in 1914 to homestead in desolate Newberry Springs. But that's how much farming, and the prospect of affordable land meant to Walter. From the time he was a child, tending gardens on borrowed patches of ground, he had agriculture in his blood. Who knew what it would lead to someday? Today's before-and-after shots should round out the Calico portion of our tour, although I think there's probably still one more installment in the Knott's Footsteps series. 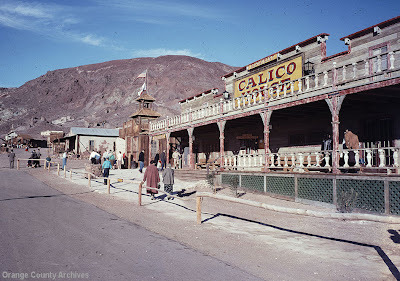 The images above show Main Street in Calico as it appeared during its real ghost town years and as it appears today. 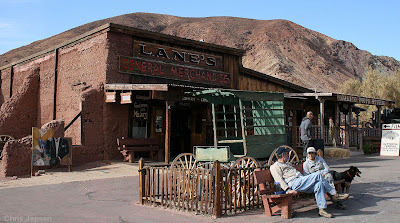 The two images that follow show Lane's General Merchandise, which is one of only a few original buildings left in town. It's built of rammed earth. The following before-and-after shots are a bit more confusing. They depict the old Calico schoolhouse in the 1890s and comparison shots today. However, the building that stands today is a scaled-down replica of the original, built by the Knotts in the 1950s. The replica building is significantly smaller. Still, it captures the spirit of the old building and is located on the same spot. I apologize for the white stripes on the 1890s exterior shot. They were painted on the print I scanned, and I was able to Photoshop out only parts of them. 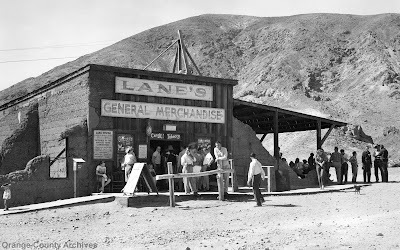 If you'd like to see more photos from our Mojave/Calico trek, visit my "Mojave" photo set on Flickr. 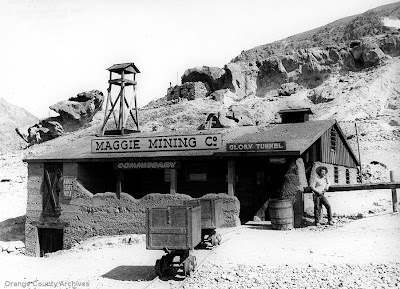 The set includes images of the Mystery Shack (like the late Haunted Shack at Knott's Berry Farm), the Maggie Mine, Boot Hill, and other points of interest in Calico. It also includes more views of the Knott homestead, the historic Cajon Pass, and the bustling metropolis of Yermo. 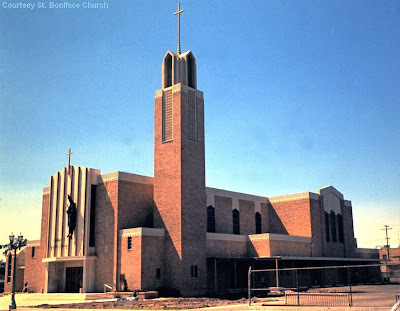 Today I'm taking another break from the Knott series to talk about the sesquicentennial (150 years) of St. Boniface Catholic Church in Anaheim. They kicked off their year-long celebration last weekend with an all-too-brief, but outstanding, historical exhibit. The photo above shows their second church, built in 1879. The photo was taken after 1891, after the building was moved to Harbor and Chartres. 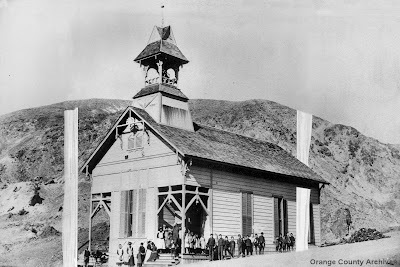 The photo below shows their third church, which was built in 1902 and torn down in 1964. Stephanie George and Carlota Haider created the exhibit. Stephanie writes, "It’s difficult to determine the date on which the first Mass was said in the burgeoning town, although sometime after 1865 seems likely. 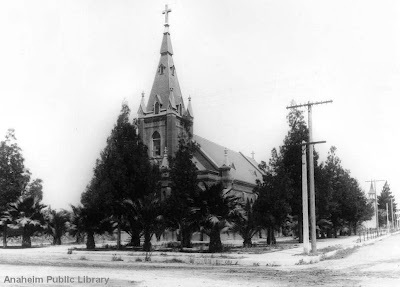 Traveling priests from San Gabriel Mission and the Plaza Church in Los Angeles frequented the area for sacraments and by 1869, the Catholic community had built a small church on a lot deeded to them from the Anaheim Water Company. "In 1875, they were officially established as a parish in the diocese of Monterey-Los Angeles. 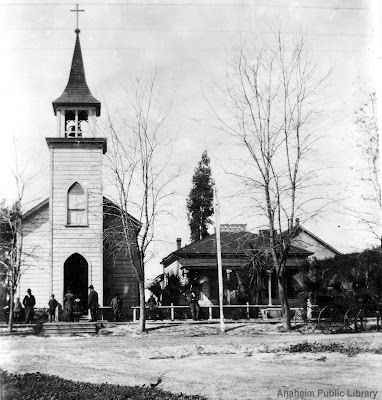 It was at this time that San Antonio de Padua de Santa Ana, the public chapel built in 1860 by funds provided by Bernardo Yorba, was designated a “mission” of St. Boniface and their sacramental records transferred to the church in Anaheim. It’s because of this that St. Boniface traces its roots to Yorba’s chapel and claims 1860 as its genesis. "The current edifice is the fourth building the Church has occupied at three different locations in the downtown area. After tearing down the first building in 1879, a second New England-style wooden clapboard church was erected on the same property on Cypress Street. This building was moved to another location in 1895 on Harbor at Chartres. In 1902, construction began on a brick Gothic-style building on the northwest corner of Harbor and Lincoln which served the parish for sixty years until the growth of the Catholic population, fueled by the post-World World II baby boom required a new building--constructed in 1963-1964--which remains today." The photo above shows the current church when it was brand new. Notice that the landscaping wasn't even in yet. 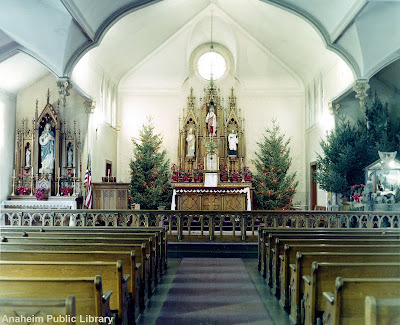 The photo below shows the 1902 church at Christmas in 1960 -- ending this post on an appropriately seasonal note. Here are some more before-and-after shots of Calico. The images above show the same view in about 1960 and today. In the second image, Phil Brigandi stands in for Walter Knott. It appears there's no longer a post to lean on. The next two images show the Calico House Restaurant in 1958 and 2009. This is the big restaurant in town. Our time in town was limited, so we opted for hotdogs instead of going here. The last two images, below, show the entrance/commisary for the Maggie Mine in the early 1950s and today. 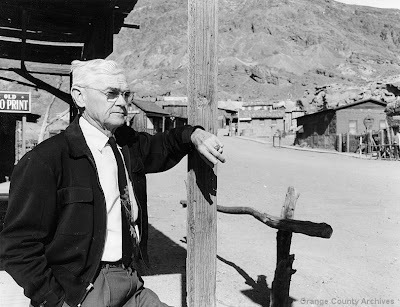 In the 1950s image, "Calico Fred" is the only person in sight. The current image includes a lot more people, including Phil, Katie, and a prospector made out of concrete by sculptor Claude Bell. Come to a party, learn about local history, and do some Christmas shopping all at the same time at the Orange County Historical Society's "Author's Night" and Holiday Party on Dec. 10th. Authors speaking about, selling and signing their books at this event include Richard Dodd (Architectural Styles in Orange County), Phil Brigandi (On My Honor: A Century of Scouting in Orange County), Doris Walker (Orange County, A Natural History), Stephanie George and Carlota Haider (Sowing Dreams, Cultivating Lives: Nikkei Farmers in Pre-WWII Orange County), Jay Jennings (Knott's Berry Farm: The Early Years), Christiane Salts (Cordelia Knott: Pioneering Business Woman), and Lawrence De Graaf (The Fullerton Way: Fifty Years at California State University, Fullerton). The folks from CSUF's Center for Oral & Public History will also have a variety of their earlier titles available for sale. There will also be holiday refreshments and perhaps a visit from a famous (jolly) special guest. The program begins at 7:30pm, at Trinity Episcopal Church, 2400 N. Canal St., Orange, and is open to the public. 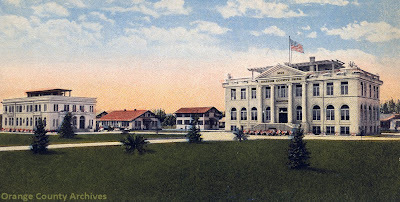 The Orange County Archives, the Old O.C. Courthouse, and the Howe-Waffle House will throw open their doors for holiday open houses this Saturday, Dec. 5th. From 10am to 4pm, the Archives will offer behind-the-scenes tours and a rare weekend opportunity to do research using their outstanding collections. The general public is welcome. 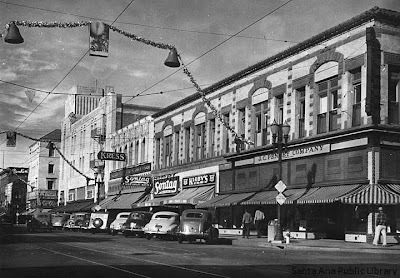 The Archives is located in the Old Courthouse at 211 W. Santa Ana Blvd., Room 101, in Santa Ana. The Museum upstairs will also be open and will offer crafts for kids and a showing of the movie "Rocky & Bullwinkle," which was filmed in the building in 2000. Also, the beautiful Dr. Howe-Waffle House & Medical Museum, just across the street, will offer refreshments and tours amid Victorian-inspired Christmas decor. The Anaheim Historical Society will hold their Annual Victorian Christmas Party at the historic Woelke-Stoffel House, 419 N. West St., this Friday, Dec. 4th. You have to see this Victorian gem (also known as "The Red Cross House") to appreciate how much restoration work has been done recently. Both the Woelke-Stoffel House and the even-more-historic Mother Colony House (next door) will also be open for open houses sponsored by the Anaheim Public Library, noon-3pm, Dec. 5 and Dec. 12. The Dana Point Historical Society's Holiday Open House will be held Dec. 6th, 2-5pm, at the Dana Point Community House, 24642 San Juan Ave. They're planning "an extensive display of the development of Capistrano Beach through the newly aquired Doheny Collection. There will be photos, tract maps, house plans, and [plans for] commercial buildings of the early 1930s." The Huntington Beach Historical Society will hold it's annual holiday open house Dec. 4th, 5-9pm, and Dec. 5th, noon-4pm, at the historic Newland House, 19820 Beach Blvd. No matter what part of O.C. 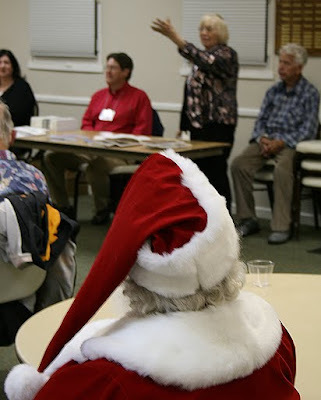 you hail from, remember that memberships in city and county historical societies make great Christmas gifts. I suppose that sounds commercial, but becoming a part of these great non-profit groups really is a win-win situation that benefits the whole community.